She would totally wear those boots if she had feet. I hope everyone had a good holiday and doesn’t feel to put out going back to work Monday. I know I’m trying to keep that stiff upper lip. Name a character and a song that reminds you of them (with artist so we can all look them up XD). Also I disagree; while I like Lances boots, I would kill for a pair like Wiglafs. New item on the christmas list! As for a song: Um. Um. I will get back to you on that, I swear! Song….Bliss, with Francium by Hatsune Miku. XD It’s a random song that simply talks and talks in a high pitched upbeat tone, never mind the whole song is nonsense. For Mordred, “When You’re Evil” by Volatire. For Wiglaf, “Take On Me” by a-ha (It just does, darnit!). For Driver, “Passenger” by Siouxie and the Banshees. Bliss’ giddiness in the last panel is funny. 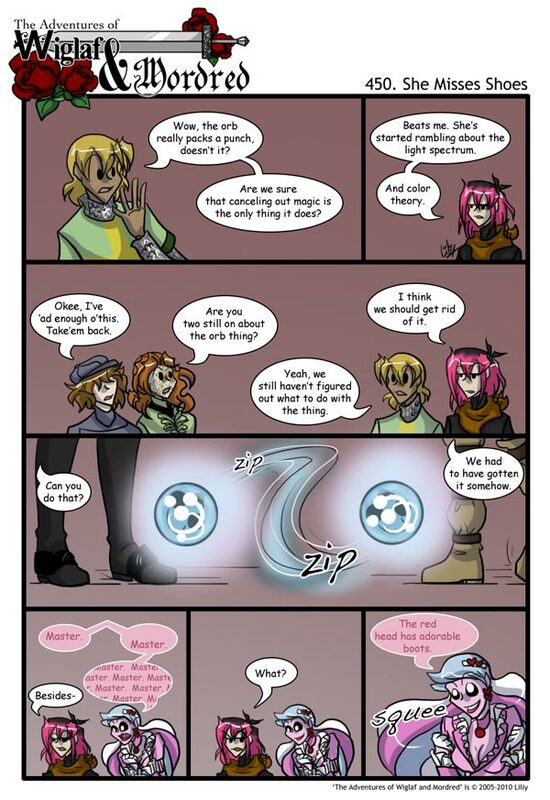 XD And the orb zipping around in the air is amusing too. Another thing, Bliss’ constant intoning of the word “Master” reminds me so much of Barbara Eden in “I Dream of Jeannie.” XD I’ll bet the theme music to “I Dream of Jeannie would suit her great. If you can handle the figurative in considering music as trouble and dancing as what one might do with such music then I would suggest for Wiglaf this: JUSTICE – D.A.N.C.E. ….If more of your characters matched classical pieces I’d give you more but I’m done for now. Hmmm…. Grace with that song… that’s umm… lemmee go google it… “You Ain’t Never Had A Friend Like Me” from that disney movie, Aladdin? Especially the line about having some power in your corner now. I can actually see Grace telling Azrael a lot of the things that the genie tells Aladdin. OH! talking about disney songs! When you asked me I blanked and thought of one thing. And then look it up on youtube. The whole group: Pirate who don’t do anything. and yes i had to get the video links…. I’d forgotten about Mraz, but you’re right about “Remedy.” That really does fit Bliss. The song “Behind Blue Eyes” by the Who has always reminded me of Mordred. poor poor Bliss, I don’t know what I’d do if I couldn’t wear shoes. Hey, I was wondering if you’d mind reading a story that I’m writing? see it’s on fictionpress.net and it’s called Blue Fire by CainReborn (or you know me) I would really apreciate it if you would tell me what you think about it. P.S. Sorry for advertising while commenting on your comic. P.P.S. I LOVE MORDRID AND WIGLAF!! The only song I can think of at the moment… would be for Bliss. Dirty Track – Wszystko bez sensu (that’d be “Everything makes no sense” or sth similar). Exactly what it says on the tin, the lyrics are very random. Artists are occult entities as well as humans, fan worship energizes them just like prayer may eventually wake up sleeping Cthulhu. I am not familiar with the exact rituals of preferred method of worship; isn’t there a FAQ entry or three that covers this yet? Mordred fit’s the song “When you’re evil” by Voltaire. Listen to the song and it’ll make sense, I assure you. I guess the title makes it as well. Hmm… since you already used the Blind Guardian song…. Sedrick: Shout 2000 – Disturbed. When I read the question about theme songs this one just popped into my sleep deprived and still groggy morning brain…. As for the rest I just KNOW that RUSH had at least a couple that would fit our two main characters. Bytor and the snow dog for one but there were a few others from that era that I think might be more appropriate … I’ll get back to you all on that when I wake up. …and that’s enough for now. Don’t remind me about Skullcrusher Mountain by Johnathan Coulton! Worst case of music/lyrics dissonance ever. If Bliss misses shoes would that mean she at one time she could wear them? Honestly, Voltaire has a song for just about everyone in the cast. He just does. Personally I’d say “This Ship’s Going Down” for Wiglaf, just for the irony. Maybe “When You’re Evil” for Azrael or Mordred. Possibly “Down at the Bottom of the Sea” for Bliss, just because it’s fast, upbeat, and if you miss even one bit, the rest is nonsense. “The Requiem” by Linkin Park; for Arthur Garrot Sr., or at least his younger incarnation. The “Dies Irae” section of Mozart’s Requiem Mass for Janus. I’ll probably be shunned for saying this, but I’ve always found this faster paced adaptation of the original work to be… inelegant. It is, however, powerful, and “Powerful and inelegant” describes Janus perfectly to me. Couldn’t sleep last night, so I did the next best thing and as I was watching “Rocky Horror Picture Show” it occurred to me: Bliss would make a great Columbia. Okay so music here I go. If I think of more I’ll tell ya’ll.